This is a short-term summer program where participants will be able to spend 3 weeks learning at a Japanese language school in Shibuya, Tokyo. In the morning, learn conversational Japanese useful in various situations in everyday life. And in the afternoon, plenty of extracurricular activities are available that can help you learn more about Japanese culture. Participants can choose between ‘Term A which includes 3D2N trip to Kyoto and Nara’ or ‘Term B which is packed with summer festivals and events in Tokyo’. Age 15 and above (high school students), those who wish to experience the culture and lifestyle in Japan while learning the language during summer break. 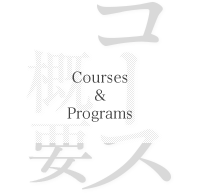 *Participants are required to be able to read hiragana and katakana. Offered only in the summer period. Not specified. Participants must make their own arrangements. Other than that, you can choose to stay at the guesthouse provided in this course (Fujimi House). *It is located within walking distance from The Naganuma School. Participants will be provided with a single room. 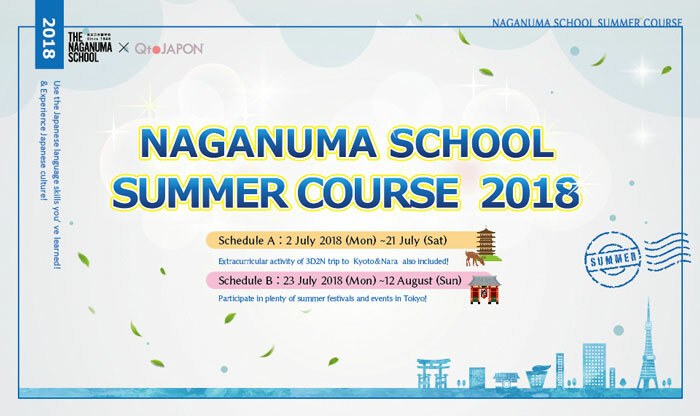 Naganuma Summer Course, QtoJapon Inc. I participated in this Summer Course for the second consecutive year this year. The course was very different from the sightseeing tour in which I participated before. I was able to learn many things, such as how to change trains at subway stations, how to communicate with the Japanese using the phrases that I learned in class and also got to learn how to get used to living in Japan. There were many new activities which I have not experienced before, like the Tokyo Bay cruise wearing a yukata and I had a real good time. I also made friends with the participants who came from various countries and I will treasure these memories. We went to Fuji-Q Highland, Tokyo Disney Sea and other places on field trips from the Summer Course. The most impressive trip was the Tokyo Bay Cruise. We took a cruise around the Bay of Tokyo wearing yukata and I enjoyed it very much. The Japanese food which I thought delicious was unaju. The restaurant was near Shibuya Station and I would like to go taste it again. My future plan is to go to the medical college of the Tokyo University and to become a doctor. I would like to come back to Japan after I graduated from the university in Thailand. I attended the Summer Course because I love Japanese culture such as J-pop. Johnny's is my favorite J-pop group. I am so delighted to be able to come to Japan this time. Japanese people are gentle and kind just as I expected. There are around-the-clock convenience stores and the subway map is easy to follow. Melon bun is one of the tasty snacks that I found at the convenience store. I used to drop by the store every morning to buy my melon bun during the Summer Course. I love Japan because things are very convenient in this country and there are many delicious things to eat.